Priya Shetty answers some common questions surrounding antibiotic resistance, and the dangers for the developing world. Since the development of the first antibiotics 50 years ago (see Box 1) the world has come to rely on these drugs to vanquish the many varieties of disease-causing bacteria. Their absence would have grave implications for the health of all populations, but particularly those of developing countries. Unfortunately, the effectiveness of antibiotics is under threat. Around the world, bacteria are mutating to defend themselves against drugs that would once have killed them. This is not unexpected — organisms constantly evolve to find ways to adapt to new circumstances. What is threatening global health is the speed with which some strains are developing resistance. Because of the enormous worldwide use of antibiotics — for example, in pills to treat human illness or as growth promoters for food animals — bacteria are adapting to modern antibiotics faster than we can create new ones. Bacteria develop resistance in different ways but they all involve either a change in their existing genetic material (known as spontaneous mutation) or the acquisition of new genetic material. The addition of new material can happen when bacteria-specific viruses (called bacteriophages) transfer DNA between two closely related bacteria. Bacteria can also absorb the DNA of bacteria in its vicinity. The most common way in which DNA can be exchanged is when small pieces of DNA called plasmids are moved between bacteria in direct contact. Altering membrane pumps. Some antibiotics collect inside the bacteria to kill it. 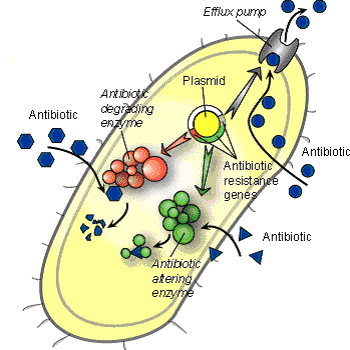 The bacteria in turn have pumps on their cell membrane to get rid of the drug. Usually, the bacteria can't pump the drug out fast enough. But if a mutation enables the bacteria to produce more pumps than normal, the drug can be ejected from the cell before it takes effect. Destroying the antibiotic with enzymes. A bacterial enzyme can destroy a key component of the antibiotic, rendering it useless. Lactamase, for example, can target the core of penicillin. Scientists are now adding 'enzyme-silencers' — such as clavulanic acid for penicillin — to make sure the antibiotic continues to work. Moving the target. The bacteria can change the molecules that the drug targets. The antibiotic would normally attach to this, so altering it stops the antibiotic from taking hold. Why are antibiotics so vital for the developing world? Unlike developed countries, where people have easy access to antibiotics, many people in developing nations — which tend to have poor healthcare systems, poor infrastructure and few resources — die from diseases that are easily treatable. Illnesses such as tuberculosis (TB) can be fatal if left untreated and, by weakening immune systems, they can make people vulnerable to severe infectious diseases, such as HIV/AIDS and malaria. Why is resistance on the rise? Some of the reasons for the growth of antibiotic resistance — such as overuse or misuse — are common to all countries, but developing countries have unique factors that tend to be absent in developed nations. For example, prescribing the right antibiotics for a bacterial illness requires accurate diagnosis. In many poor countries, such diagnostics are simply non-existent. Faced with a sick patient but no way of finding out exactly what they are infected with, doctors will often make an educated guess at the cause of illness or prescribe an antibiotic that targets several bacteria. Causes of antibiotic resistance in developed countries — the growing use of antibacterial detergents, and pressures on doctors from patients who want to be prescribed antibiotics regardless of whether they are necessary — are also relevant to developing countries. 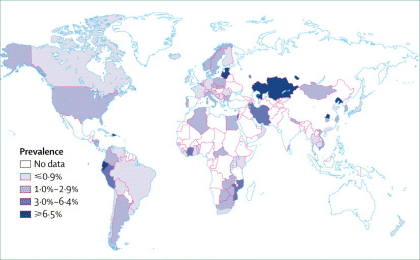 Global travel means that antibiotic-resistant bacteria are not confined to the country in which they originate. Why can't we just make more? An obvious question is why drug companies can't simply produce more antibiotics. Firstly, developing new drugs is enormously expensive. It costs about US$900 million to bring a drug from research to market. The investment needed to research and produce these drugs can sometimes cost far more than the companies are ever likely to see from drug sales. Experts estimate that research and development into antibiotics has fallen by about 60 per cent in the past decade. Given a choice between focusing on antibiotics or other drugs that are likely to yield a better return, pharmaceutical companies understandably often choose the latter. Even if drug companies were given more incentive to research new antibiotics, one barrier is the growing difficulty of discovering new drug classes. In the early days of antibiotic development, new classes were identified every few years, but inevitably this has slowed down. 1928 Alexander Fleming discovers the antibacterial properties of penicillin in mould. 1930s A drug group called the sulfonamides became the first generation of antibiotics. 1941 Selman Waksman coins the term 'antibiotic'. 1940s Mass production of penicillin begins. Low doses begin to be used to speed the growth of food animals. 1950s A penicillin-resistant strain of Staphylococcus aureus infects hospitals in many countries. 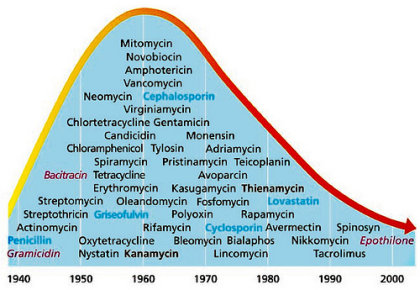 1950s and 1960s Second-generation drugs, such as chloramphenicol and terramycin, begin to be widely used. New synthetic variants of penicillin are developed. MRSA makes it first appearance. 1980s and 1990s Variants of older drugs are found but no new classes discovered. This article is part of a Spotlight on Fighting antibiotic resistance. Reyes H., et al. Antibiotic noncompliance and waste in upper respiratory infections and acute diarrhea. Journal of Clinical Epidemiology 50, 1297–1304 (1997).